Campaign Comes To A Successful Close! The campaign is over. 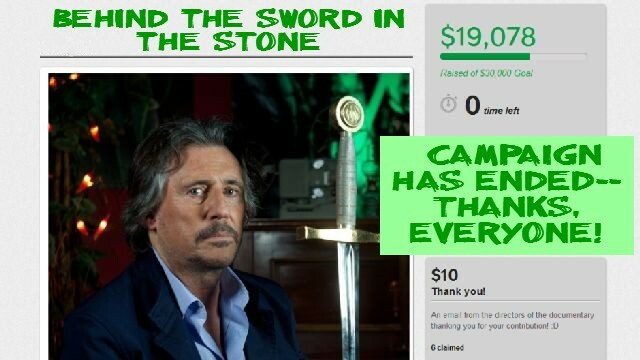 Alec Moore and Mark Wright, the creative team at Mossy Hare Productions, now have almost $20,000 (2/3 of their original campaign goal) to help them with post-production costs for their documentary, Behind The Sword In The Stone. As an Executive Producer for this film, I want to thank everyone–Byrneholics, Excalibur fans, Gabriel Byrne fans, other fans, and people who support independent film–for their contributions! I also want to thank those who helped get the word out about this initiative. Crowd-funding is social media at its best and you really stepped up to the plate quickly! THANK YOU EVERYONE. Let’s see what happens next, so stay tuned! 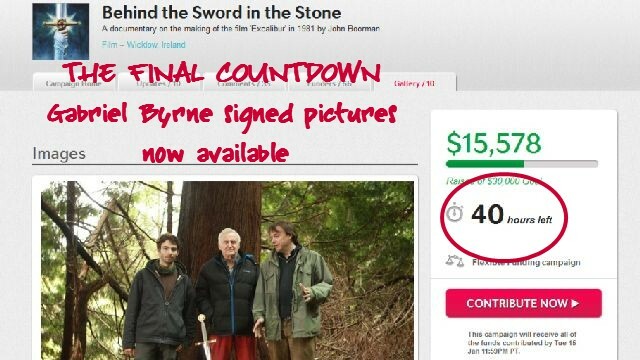 According to Behind The Sword In The Stone documentary director Alec Moore, signed photographs of Gabriel Byrne are now available as a perk when you make a contribution of $150. This is wonderful for Gabriel Byrne fans and it is so great that Mr. Byrne and Mr. Moore have been able to coordinate this offering in the last stretch of this initiative! Kudos to both of them. Support Independent Film! Contribute to the making of this documentary! Just make me cry why don’t ya. I hate being poor. I hope it will be possible to make Behind the sword in the stone, even if it is not enough money to finish the movie yet. It sounds like a very interesting documentary. If you would like to contribute to the making of this film, you still can! So, drop them an email and get the details. There are still some perks you could receive, too! Stella thanks for all the news than I HAVE RECEIVING OF YOU, IT IS MY WISH THAN THIS FILMS CAN BE ABLE TO SEE IN ARGENTINE TOO IN A SHORT TIME.. MY BEST WISHES FOR YOU AND ALL MY ADMIRATION AND AFFECTION TO GABRIEL I BRING HIM IN MY HEART ALL THE SUCCESS IN ALL THE THINGS THAN HE DONE . Dora, I hope you can see all of Gabriel’s films in Argentina someday. Thanks for visiting here and thanks for your good wishes, for me and for Mr. Byrne!